The above rolls are available in 1" and 2-1/4" core. 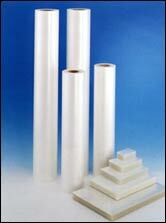 3" core films are available in longer lengths. Many other configurations are available. Call for details. Specialty types are also available.